Kentucky Fried Chicken is hardly considered a suitable place to get one’s food for a traditional Christmas meal in most parts of the world. There is one exception, though. In Japan, it is a Christmas tradition to order KFC. So how exactly did Christmas, the celebration of the birth of Jesus Christ, become synonymous with a bucket of fried chicken in the land of the rising sun? Well for one, Christmas wasn’t really celebrated at all historically in Japan and has only relatively recently been adopted. The Japanese predominantly followed the Buddhism and Shinto religions, so Christmas was essentially adopted from the West and holds little religious significance to many Japanese, even today. In fact, Christianity was actually banned throughout Japan in the 1600s and continued to be so until the mid 1800s. However, during this period, a small enclave group of Japanese Christians, known as ‘Kakure Kirishitan’ (“hidden Christians”) continued the missionary work of Saint Francis Xavier who arrived in Japan in 1549. The religion, along with Christmas, reemerged somewhere between 1868 and 1912. It wasn’t long after that many Japanese started to mirror Western Christmas traditions like exchanging gifts, decorating trees, putting up lights, etc, even though it was not a national holiday in Japan. So where did KFC come in? According to KFC, this particular unusual Christmas tradition is said to date back to the 1970s when supposedly a customer at the chain’s Aoyama store observed that, in a land bereft of the customary turkey for a celebratory dinner, fried chicken was the next best thing. 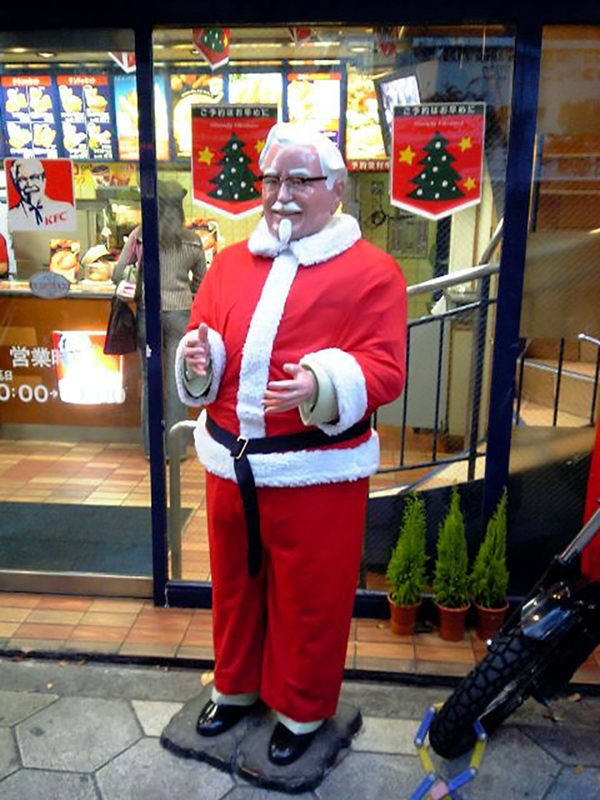 This idea eventually percolated up to the corporate offices of KFC and prompted the company to start a huge advertising campaign in Japan called “Kurisumasu ni wa kentakkii!” (Kentucky for Christmas!) in 1974, which became ludicrously popular thanks to this campaign and the popularity of American culture in Japan at the time. KFC has milked this Christmas tradition in the country ever since, and even portrays their founder and well known icon, Colonel Sanders, as Father Christmas, dressing statues of him outside every KFC in Santa suits…. Yes, Colonel Santa! 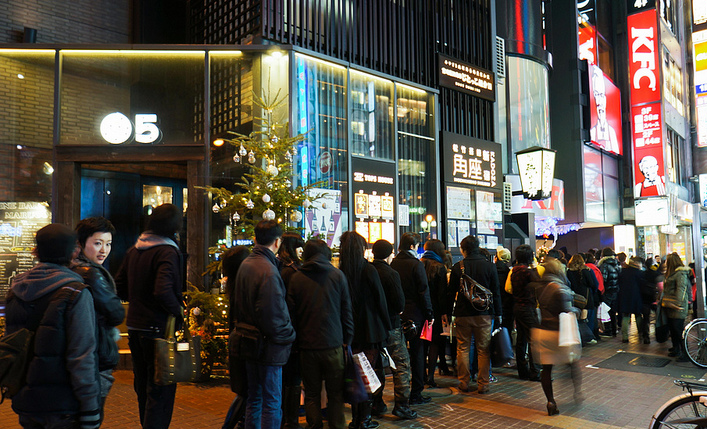 The custom of eating KFC for Christmas is so popular in Japan that you’ll not only see lines of people snaked outside every branch in the country at this time, but people even reserve their buckets of chicken well in advance to make sure they don’t miss out. Was Colonel Sanders Really a Colonel? Colonel Sanders’ life is a lesson that you’re never too old to start over. You see, the Colonel didn’t become such until around the age most people are retiring. At 62, he was mostly broke and living out of his car, just one of many times in his life he was in that sort of situation. But then he managed to convince Pete Harmon, owner of the Do Drop Inn in Salt Lake City, Utah, to use his fried chicken recipe and pay Sanders a nickel per piece of chicken sold, and things started to go his way from there. You can read much more on all this here, including learning about that time he got in a shootout with a worker from his competition across the street from the business he owned, ultimately shooting the man but getting off scot-free. I would like to know why people think Xmas has anything to do with this Jesus person, and how the Japanese got talked into doing the Xmas thing. It saddens my heart to see that they got sucked into it. I am glad to hear Xmas does not hold any religious significance though. It is interesting how this site reports the news with some facts, and other not fact, as fact, such as what Xmas is actually about. @Lance Zimmerman: Let’s start with the name: “Christmas” or “Xmas” which is just the classic shorthand version of “Christmas”. Some people try to use “Xmas” to try to disassociate the name from Christ, which some Christians like to get offended about, but here’s an interesting fact for you: The X here indicates the Greek letter “Chi” which is traditionally shorthand for “Christ”, at least for the last thousand years or so. (short for , which is Greek for Christ. “Xmas” was first actually used by scholars and they also often used the “X” anywhere the word “Christ” came up, even in a name like Christina (Xina). So the “X” in “Xmas” doesn’t take the “Christ” out of “Christmas”. Various groups have had other types of celebrations around December 25th, generally having to do with the winter solstice, long before the Christian church decided to celebrate Christ’s birthday on that date. But that doesn’t discount the fact that the specific holiday called “Christmas” is rooted as a celebration of Christ’s birth, even if there are and were other holidays near and even on that date, such as the Roman winter solstice. Many of the traditional aspects of Christmas are borrowed from these older celebrations, but at its core, Christmas was once a celebration of Christ’s birth and to many, still is today, even if the holiday has been largely commercialized. As far as the Japanese getting talked into it, is that really a mystery? Businesses want to make more money. Christmas has turned into a money making machine where it is celebrated. Thus, if they can, retailers will push it down the throats of anyone not celebrating it until they accept it and it becomes tradition, even if it has nothing to do with any religious celebration for those people. The first bonus factoid is misleading if not incorrect. KFC is cheap in Japan. In Japan. $46 dollars is a lot of money in the USA, but not in Japan. Can you tell me the origin of the applause? I can’t speak to Japan, but for years, KFC was our family’s default meal on the way home from Christmas Eve mass.